No Noise is Illegal ! In only one city in Texas would you expect to find 20 alternative, radical, activist, community, brass, marching bands. 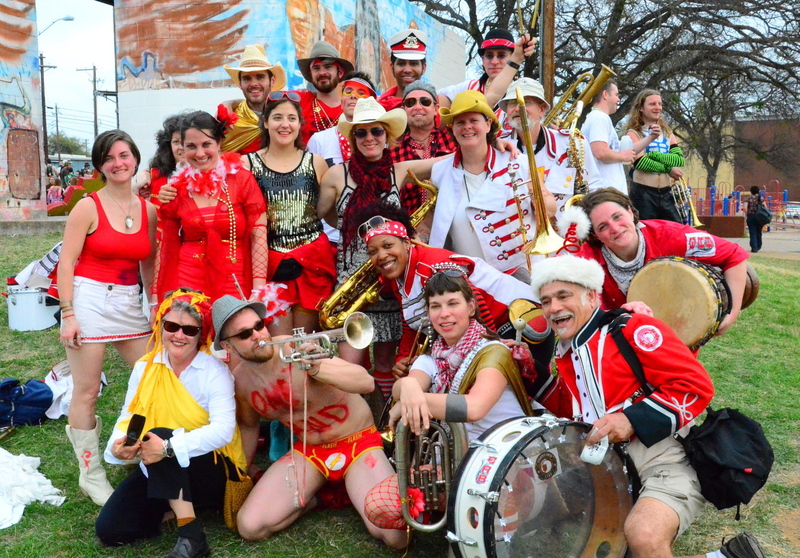 This year marked the first annual HONK TX festival held the weekend before SXSW March 11-13th in public spaces across Austin. While this year marked the first Annual HONK TX festival, the concept of gathering activist marching bands to celebrate the community-centered union of art, activism and music finds its roots here on the east coast. The very first HONK! made its debut on Columbus Day weekend of 2006 in Somerville MA, a community just outside the city limits of Boston. 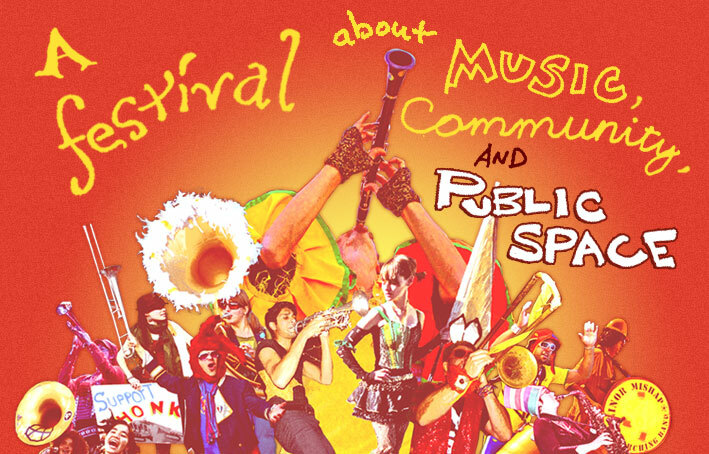 The concept of HONK was envisioned by local activist band, The Second Line Social Aid and Pleasure Society Brass Band (SLAPS), who “saw the need for a gathering of like-minded souls interested in applying the joy of music to the work of promoting peace, social justice, and civic engagement.” That year a dozen socially conscious street bands from across the US and Canada descended upon Somerville and Cambridge to perform in Davis and Harvard Square. HONK Fest 2006 signaled the beginning of a tradition that would spread far and wide across the states. By HONK Fest 2009, more than 29 bands were overflowing the streets of Somerville spreading the message of music, community, and access to public space. Between 2006 and 2010, HONKS! arose here in Providence (PRONK! ), Brooklyn (BONK! ), Seattle (HONK! Fest West), and now Austin (HONK! TX). Creation of inclusive communities valuing diversity of all forms: not just the conventions of age, gender, class and orientation – but background, upbringing, and for many, level of musical experience. Transformation of everyday locations into organic stages where the line between audience and performers is dissolved. Demonstration of the potential for the creative use of our public spaces without the need for amplification or artificial stages. Celebration, serving as the soundtrack for community gardens, public school yards, puppet shows, pride parades, worker rallies, peace marches and neighborhood fundraisers. 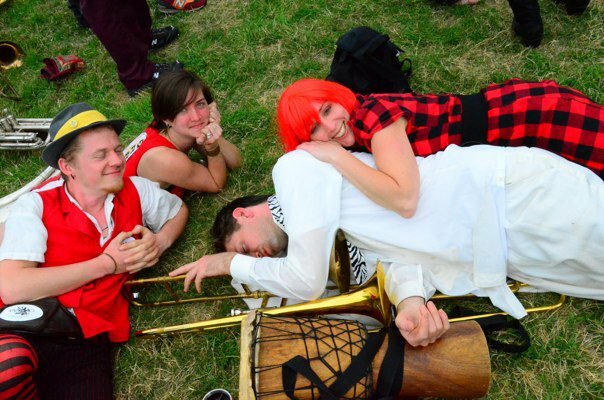 The shared values of the growing activist marching band moment are central in creating the environment that is HONK! Regardless of the city each HONK serves as a space where we as individuals learn and grow from each other musically, personally, politically, socially, and culturally. 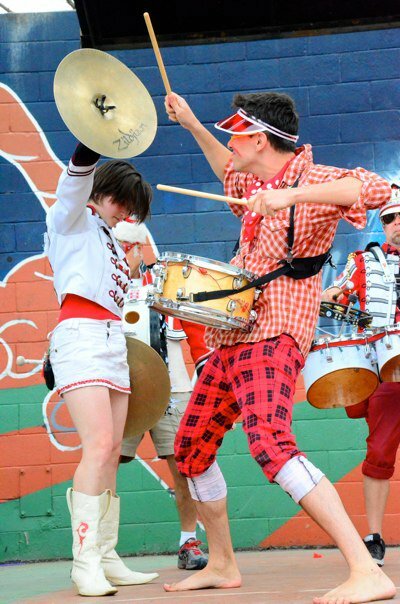 This years ERB appearance at HONK TX represents the bands 6th HONK event. With 2 HONK, 2 PRONK, and 1 HONK Fest West under our belt we headed south of the Mason Dixon Line to make our appearance as part of HONK! TX. As the closing band of the entire weekend we were given the monumental task of bringing together the many elements that represent HONK! Staying true to the inclusive communal nature that is the HONK! experience we invited all 20 bands in attendance to join us on stage for our closing song Deep in the Heart of Texas. Carrying the message of hope, unity, and social change in our hearts and music we closed the weekend together on stage as One Band with One Sound conveying to our audience and ourselves the transformational nature that is HONK! When did you first understand the power of music? 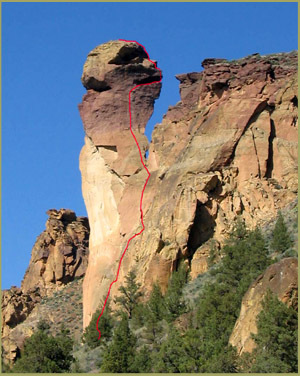 Monkey Face part of my adventure in Oregon! Artists are magical helpers. Evoking symbols and motifs that connect us to our deeper selves, they can help us along the heroic journey of our own lives. While taking a lunch break from my welding project last week I found myself in a discussion with a fellow band member of our need to not be tied down to one kind of work. This year has allowed me the the opportunity to search out a bunch of differnt kinds of work all of which I find fulfilling. I have facilitated community building and leadership trainings, taught rock climbing lessons to high school students and special needs individuals, designed and welded bike racks and trash cans, and am now about to head off to lead a service learning course on Health Policy at Berkley in CA. Around this course and training I have built a 6 week adventure that will take me across the country and back. It starts in Chicago, Illinois where I will participate in a training for the Health Policy Class and meet my co-facilitators, I will then head down to Austin Texas to meet up with my band the Extraordinary Rendition Band to participate in HONK TX for a week, from there I am headed to Bend Oregon to Rock Climb at Smith Rock for 2 weeks. After my time camping and climbing I will head back to civilization to meet my with my co-facilitators in San Francisco, one from nevada and the other from Israel, to teach the Health Policy Class. Upon the completion of the class I will move on to Charlotte North Carolina to visit with a friend who works in the Arts field there and was instrumental in the beginnings of my artistic stirrings and questionings. My adventure I hope will open me up to many new insights and allow me to continue on my path of growth I have set out for myself this year. 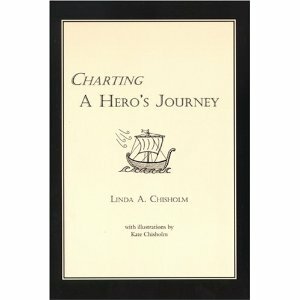 I first encountered the work of David Campbell in Lina Chisholm’s Charting a hero’s Journey. The book is a publication of the International Partnership for Service Learning and Leadership and was utilized as part of my studies in Ecuador . The book serves as a guided journaling prompt for those traveling for the first time, most often abroad. While my travel to Ecuador was not my first time abroad I still found it’s content quite useful in dissecting my experience while there. It gave me the space to be reflective about my intentions and the ability to recognize the personal conversations and changes that traveling was having on me. 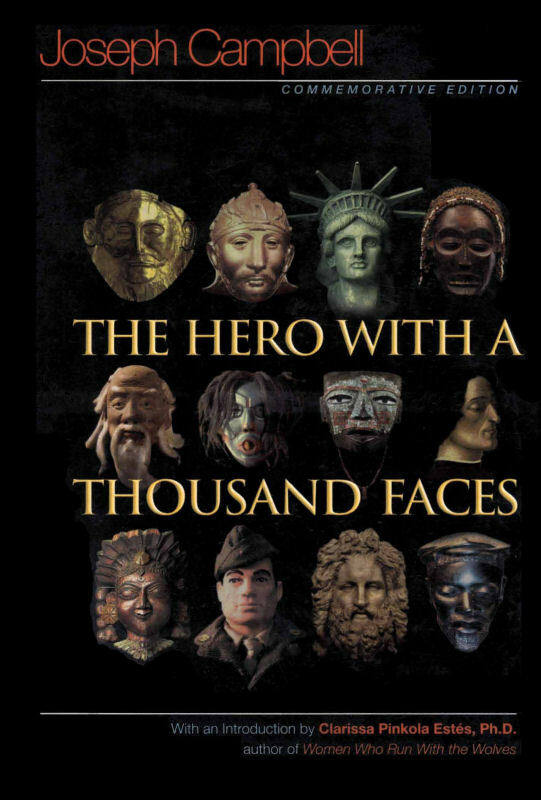 Campbell speaks of the Monolyth, the basic elements common amongst all myths that chart a the heroines journey, a sort of rite of passage, in which the heros undergoes separation, initiation, and return. Linda Chisholm applies this structure to the experiences of the reflective traveler. From the following description you can see the parallels that can be drawn between Campbell’s story and that of a traveler in search of understanding their sense of self and their purpose and contributions to the world. Traveling for me opens my horizons it allows me to see the world in ways I that expand my small city nature. As a life long Providenceite I feel comfortable in the city and often times attempts to find ways to challenge myself. Climbing is a major component of this but so is just getting outside Rhode Island. As I embark on this 6 week adventure I look forward to the insights I will gain and the new found knowledge of myself and the world I will bring back with me. In what ways do you challenge yourself?